The success of online platforms such as Airbnb, Etsy and Fiverr that the online marketplace model is applicable to a multitude of areas. Main challenges that online marketplaces or platforms face are centered around bringing meaningful and credible engagement between users. Buyers on the platform gain value from performance in speed, quality, costs, flexibility, and dependability. Meanwhile sellers of online marketplaces look for a loyal and growing customer base. Create trust between both user personas, buyers and sellers, in order to foster quality engagement through your online marketplace or platform. Ensure that your online marketplace achieves success and sustainable scalability through digital marketing strategies. 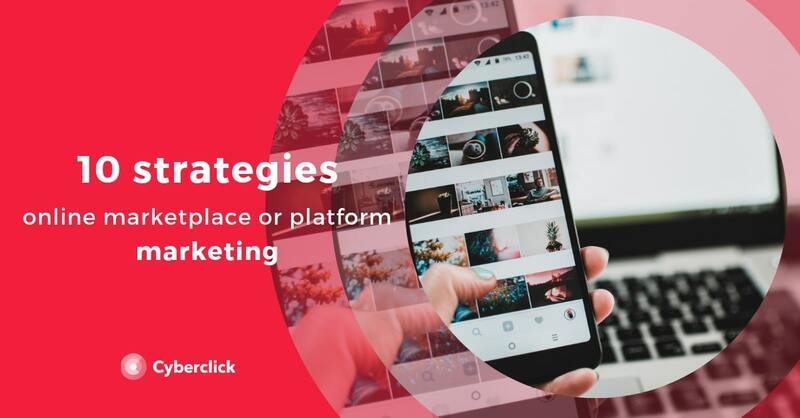 This article explore the top 10 digital marketing strategies for success with your online marketplace or platform. Specifying the focus on a specific market segment of the online platform will help you ensure you reach your target audience. Start-ups that are targeting all segments end up reaching no segments. Amazon started by specifying their platform in the market segment of books. When you specify a smaller market segment, this allows you to build and design our niche skilfully. Dedicate resources adequately to a more specific segment always ensuring you are able to execute on your performance objectives of speed, quality, costs, flexibility, dependability due to an initially uncontrollable size. As you scale your customer base, ensure to drive your ability to learn as an organisation. Sustainability scalability involves continuous improvement to maintain performance standards for a growing marketplace of increasing numbers of peers. A conscious scaling process ensures continuous satisfaction among platform peers as well as efficient use of organisational resources including time, effort, and financial reserves. To begin, specify your online platform’s market, and focus all resources to succeed in this segment. The more specific your market segment becomes, the better you can ensure you are reaching your targeted group. If you want to create an online marketplace for sustainable fashion apparel? Try focusing on a specific section such as women’s leisure wear out of bamboo. Starting as an expert in a smaller field will allow you to perform at high levels which will give your brand credibility and the chance to establish as the best in field. As you gain trust and enlarge your customer base, look into sustainable scaling. Initially your marketplace will cater to specific personas of buyers and sellers. Explore who these specific personas are and draw up the key characteristics that make up the essence of these figures. Personas are there to raise the question who is this marketplace for? Why do buyers and sellers choose our online platform? Who is your buyer or seller demographically? What objectives motivate your buyer or seller? In what way does your buyer need you? In what way does your seller need you? How can you help your buyers and sellers? What are the driving pain points of your buyers and sellers? What does an empathy map of both buyers and sellers look like according to research based findings? Strengthen existing user relationships, that you've spent time, money and resources acquiring. It’s a lot more expensive to get new users than to keep and grow existing user relationships. 80% of new leads never translate into sales and companies that excel at lead nurturing generate 50% more sales ready leads at a 33% lower cost. Strengthening your existing user base is all about user relationship management. Incentivise your existing user base to engage regularly in your online marketplace. Email marketing has proven to be particularly successful and cost-effective here. Actively and regularly inform users with relevant content such as personally targeted offers. Essential to your marketing strategy will be to transmit trust to buyers and sellers of the online platform in order to drive meaningful engagement. User engagement will see less barriers as users begin to have trust in your reputation. As you build your reputation, remember that to foster trust, all company actions and behaviours should represent extension of the company values. Ensure that actions are in line with your organisational values. On a more practical level, foster quality engagement through prioritising performance objectives of speed, quality, costs, flexibility, dependability. Get the most out of your efforts by making them visible. Use seals of approval and testimonials to make your efforts transparent and build your reputation. This in turn will foster a sense of trust among both buyers and sellers, inviting them to meaningful engagement. Don’t sell, tell a story. Inbound marketing, is a natural way of sharing knowledge and build relationships without looking in need of selling yourself. Successful inbound marketing will engage with your platform buyers and sellers by making use of their persona profiles to educate, excite, and empower these. Create content and stories that focus on your specific market segment needs as opposed to focusing on your business needs as an online marketplace. Craft your content in an engaging language that leads your audience through a story, whilst continuously making clear the value add that you are providing. Users know what they are looking for, so make titles representative of your content, steering clear of clickbait titles and headlines. With creating effective titles, it is essential to analyse periodically the most relevant metrics (CTR, time of visit, bounce rate) and make all changes and tests necessary for finding the most appropriate title. As a content marketer, your main goal should be to make your content that is relevant and adds value. Create stories that are helpful, informative or entertaining and transmit your company values. Engage your target audience at an emotional level by letting go of the mindset to sell, and adopting the mindset of telling a story. Viral marketing means promoting the growth of a website, for example through targeted marketing in online communities and social media groups, so that new customers are generated. To carry out a viral marketing campaign, create valuable content for your users that is attractive to share on their own social networks. So called ‘referral marketing’ has also proven to have viral effects. This is where users are incentivised to refer your online marketplace through receiving a personal benefits when one of their contacts arrives on your site. Try adding elements to incentivise sharing such as discounts and promotions for your users to get them to refer you. This can save time, effort, and financial resources in your marketing department. Popular platforms are attractive. Buyers want committed sellers, and sellers want committed buyers. More buyers attract more sellers, and more sellers attract more buyers. Online marketplaces and platforms gain attractiveness as they grow, this is called the network effect. The question is, where do we start? Taking the case of the online fashion apparel marketplace, a bamboo cloth sock manufacturer, a bamboo handbag crafter and a bamboo jewellery maker all share a common problem. Each are specialists in their individual craft, but neither know how to reach their target audience. Marketing is what attracts the right consumers who want to pay for their products and services. Platforms and marketplaces are a way of using the individual offerings, to offer buyers a better overall shopping experience. Start with inbound marketing strategies through useful and relevant content. Over time, this will attract prospects and credible buyers. This way meaningful transactions can commence as soon as you introduce your first seller onto the platform. On the contrary, if you invest efforts into attracting sellers first, you run the risk of having your efforts go to vain in the absence of credible buyers. The bottom line is, sellers come where the buyers are, so focus on customer development first. Use social media to engage with your various online marketplace personas. Allow buyers and sellers to create an emotional bond with your platform by getting them to understand your values and transmitting your intentions. Social media is where you can define your company culture, share relevant content, and allow your behaviour to be an extension of your organisational values. Show your appreciation to buyers and sellers by maintaining active engagement. Check your social media accounts daily and keep them up to date with user engagement. Post links to new content on your blog or site, and establish a presence as an active, friendly company. Make use of existing social media groups. These are a filtered space for your specific market segment. Social media groups potentially hold the future peers of your online platform. Dedicate resources to transmitting your commitment and credibility and convert members into enthusiastic buyers and sellers of your online marketplace. More than 450 million people are already visiting groups on Facebook to buy or sell every month. Established groups can be used to your advantage and growth. Provide useful, informative content and users will do the sharing for you. Transform users into a loyal community through creating expectations for high quality content regularly. Succeed as a community manager and keep users coming back for more by keeping them up to date on key events, new ideas and innovative industry insights. BuzzSumo is an analytics tool that analyses performance of content topics among a particular demographic. Getting your users to feel part of a community further develops an emotional dimension to the relationship and will foster customer loyalty. Search engine optimisation (SEO) determines your ranking on Google. Have users find you in the moment they are looking for the relevant product by ranking in search engine result page positions. Make it a joint effort by creating guidelines for seller offerings on your platform to ensure their content is SEO optimised. Give your sellers the opportunity to provide detailed product descriptions. Search engine optimised content will allow the data stored on your site to be more easily accessed by search engine algorithms, and score you a higher ranking. Your search engine results page ranking will score higher the higher the quality of your content. Get your online community to improve your SEO score for you by engaging them to publish their own content such as product reviews, interacting with FAQs, leave comments on the platforms content, or blog about industry insights they are finding too. Whilst your buyers and sellers can contribute their part, most commonly, it is the online marketplaces and platforms themselves who have the responsibility to position their site. Providing the users of your online marketplace with a high SEO positioning is your way of communicate that you are putting in the effort to gives them the recognition they deserve. Search engine optimisation is a profession on it’s own, but a great place to start is by dividing your products into categories and subcategories - this makes it easier for search engines to review and list your individual pages.